Based Kent, Somerset and London, Direction Law offer Shared Ownership and other types of Affordable Housing conveyancing throught the South. We work closely with numerous Housing Associations and Developers across the whole of the UK. Therefore, wherever you are buying, we should be your first choice for a specialist conveyancing service. and indeed all types of Housing Association conveyancing anywhere in the UK! Direction Law not only act for private individuals buying or selling through Affordable Housing schemes, we also act for a number of Housing Associations and Developers on their acquisitions and on the sale of New Build properties. Private individuals who instruct us therefore can rest assured that they are dealing with recognised specialists within the field. If you instruct us on your Affordable Housing purchase you will benefit from the many years of experience offered by the Partners and staff at Direction Law. Our firm comprises the merged practices of FST Solicitors and HSA Law and incorporates the former firms of Synergy Law and Lexica Law, all of whom were specialists in Affordable Housing Conveyancing. As specialists in Affordable Housing Conveyancing we offer highly competitive fees compared to other firms of Conveyancing Solicitors - this is required by the Housing Associations and Developers we work with. Why pay for a non-specialist solicitor to learn all about Shared Ownership, Help to Buy etc. when you can instruct a firm with all the necessary expertise at a highly competitive rate? 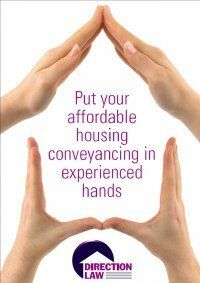 Call our quotation team today on 01227 812733 for a detailed quotation and receive our Guide to the Affordable Housing Conveyancing Process. Alternatively, you can get in touch by using the Contact Us page of this website, or you can visit our main website and complete the online quotation form. At Direction Law we are transparent about what we charge. If you receive a quotation from another firm which appears to be cheaper, often it isn't! We will cut through the jargon and tell you what they are really charging.